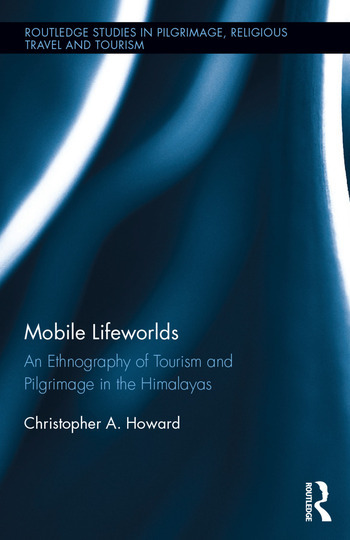 Mobile Lifeworlds illustrates how the imaginaries and ideals of Western travellers, especially those of untouched nature and spiritual enlightenment, are consistent with media representations of the Himalayan region, romanticism and modernity at large. Blending tourism and pilgrimage, travel across Nepal, Tibet, Bhutan, and Northern India is often inspired and oriented by a search for authenticity, adventure and Otherness. Such valued ideals are shown, however, to be contested by the very forces and configurations that enable global mobility. The role ubiquitous media and mobile technologies now play in framing travel experiences are explored, revealing a situation in which actors are neither here nor there, but increasingly are ‘inter-placed’ across planetary landscapes. Beyond institutionalised religious contexts and the visiting of sacred sites, the author shows how a secular religiosity manifests in practical, bodily encounters with foreign environments. This book is unique in that it draws on a dynamic and innovative set of disciplinary and theoretical perspectives, especially phenomenology, the mobilities paradigm and philosophical anthropology. The volume breaks fresh ground in pilgrimage, tourism and travel studies by unfolding the complex relationships between the virtual, imaginary and corporeal dynamics of contemporary mobile lifeworlds. Christopher A. Howard is Visiting Lecturer in the College of General Studies at Boston University. Drawing on social theory and interpretative methodologies, his research focuses on the changing relations between humans, environment and technology. His recent publications cover topics ranging from neoliberalism in the Pacific Rim to being online, and the urban/rural divide.